Shopping in the Martin Place precinct is set to change forever with ISPT this week gaining approval for the major redevelopment and revitalisation of its adjacent buildings at 345 and 363 George Street, and 24 York Street, to create a new precinct with a major centralised lobby and new luxury high street retail destination in the heart of the CBD. The City of Sydney Council approval gives the green light to one of the city’s most important retail projects in recent times. New luxury flagship retail will interface with George Street and bookend Martin Place at a time when more and more international retailers are intensifying their search for a Sydney presence. 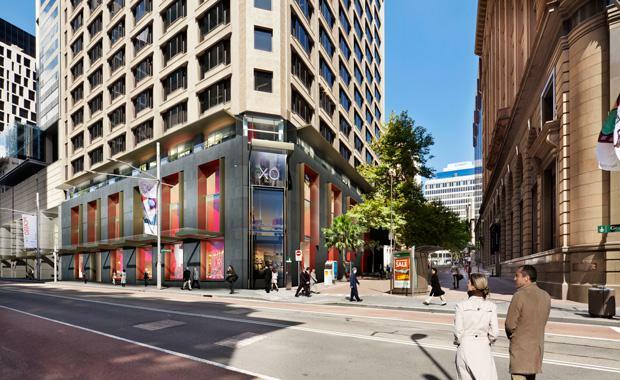 The circa $75 million redevelopment, encompassing the office towers at 345 and 363 George Street as well as the heritage-listed 24 York Street, will also incorporate new facades, entries and awnings to enhance George Street’s evolving pedestrian experience and light rail transformation. The project will take centre stage in the luxury retail precinct emerging on George Street, with retailers set to take advantage of the major increase in pedestrian thoroughfare. ISPT acquired the three adjacent A Grade commercial office towers in September 2006 and, following an extensive customer engagement and workshop program, decided the timing was ideal to create value through repositioning and combining the premium office buildings with approximately 3000sqm of luxury high street retail to create a new precinct. ISPT is one of Australia’s largest unlisted property fund managers with over $12.2 billion in funds under management. Today, more than 50% of Australian workers have their retirement savings invested in property through ISPT. Much like the way ISPT revitalised Brisbane’s Queen Street Mall, putting it on the radar of high profile international brands, the George Street redevelopment will breathe new life into one of Sydney CBD’s busiest precincts. From a locational perspective, the project enjoys distinct advantages and makes sound retail sense, said ISPT Core Fund Manager Mark Bassett. “Our ownership of these three adjacent buildings creates a unique opportunity in the absolute heart of the Sydney CBD. We specialise in creating places that work, and we plan to deliver a progressive, engaging experience for retail customers which will also complement and unify the A Grade office accommodation and amenity for our commercial customers,” Mr Bassett said. “The redevelopment will seamlessly integrate a new centralised super lobby to service the commercial component, while retail on the ground floor, level one and two will deliver strong brand presence at a very prominent high street address on the corner of Barrack and George Streets. “More than just a new luxury retail destination, this project will showcase international design trends to become a statement piece that will link, respond and add to the streetscape. As a place it will work to not only enrich the character and amenity of this CBD heartland, it will also operate as a community in its own right,” Mr Bassett said. The redevelopment will be a collaborative effort from an experienced project team. ISPT is the owner and development manager and is working with Colliers International to coordinate the retail leasing for the project, while architects FKAM has applied its international design expertise, including the imagining of a modern stone and glass facade. CBRE is headquartered at 363 George Street and as property manager will play an important role in making the vision for the project a reality, while also providing commercial leasing services in conjunction with Cadigal Office Leasing. The project aligns with the NSW Government’s extensive program of infrastructure works across the city, particularly the pedestrianisation of George Street. Upgrade works and new entries for 345 and 363 George Street will complement the beautification program underway to further improve the public amenity. The existing link from George Street to York Street will remain a thoroughfare and the works will provide an enhanced experience through the creation of a feature ceiling, dynamic art displays and a diverse food and beverage offer. Work is expected to commence later this year with the construction program to take around 12 months.